What happens if you trip or fall and injure yourself? You might feel like there’s nothing you can do. In many cases you may blame yourself. But if you fell because of a crack, a wet floor, or an obstacle that shouldn’t be there, your accident is at least partly the fault of whoever maintains the premises. And if you needed medical treatment or missed work because of your injury, you may be entitled to compensation. It doesn’t matter where your accident occurred, or whether it is private or public proerty. Whoever owns or manages the premises has a legal obligation to keep them in safe working order or to make sure people know where to watch their step. 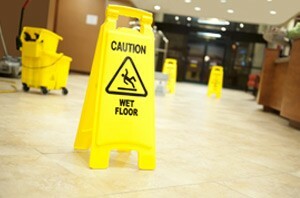 If you fell because of an unsafe condition, the owner or manager is at fault—most of the time. Actual notice. Actual notice means someone told the owner or manager about the problem. If they didn’t have someone fix the issue or neglected to put up a noticeable warning sign, they are at fault. Constructive notice. Constructive notice just means the problem has been there so long that the owner/manager should have known about it and done something. There are many ways to find out how long a hazard has been there. If a crack has moss in it, it’s been around a while. Security footage can also reveal how long a hazard has been around. Cause and creation. Cause and creation means that the owner/manager is the one who put the hazard there, so of course they know about it. If they mopped the floors and didn’t put up a wet floor sign, they caused and created the hazard. No other notice is needed. In most cases these are all the criteria you need to meet. However, if the accident happened on city property the standards are a bit higher. The City of New York is only to blame if they had prior written notice of the hazard, or if they created it themselves. Many people who slip and get injured end up blaming themselves. This is truly a shame because it means you can miss out on compensation that the law says you’re owed. It can leave you with steep medical bills or missed work time. Ultimately, a jury will decide who bears the fault for your accident. In some cases they’ll assign partial liability. For example, they might say you are 50% responsible because you weren’t watching your step, and the owner is 50% responsible for not fixing the crack. In that case, if you were seeking $50,000 in compensation, you would walk away with half, or $25,000. $25,000 is a lot better than $0, and can make a real difference when you have medical bills. How do you know if you have a case for your slip and fall injury? The only way to know is to talk to a lawyer. Steven Weinstein has seen hundreds of slip and fall cases. He has learned from firsthand experience which cases are likely to win at trial or get a settlement. He will listen to the facts of your case and help you decide if it’s worth it to move forward. And with The Weinstein Law Group, PLLC you pay absolutely nothing unless we win money for you. Don’t pass up money when you need it most. Call us today and set up your free consultation. You’ll get all your questions about your case answered, and we’ll help you understand if you’re likely to get compensation. Call us at 212-741-3800 or contact us online and get your FREE consultation.